We talk to customers on a daily basis that ask, “How do I know when my dryer vent needs to be cleaned?”. The normal recommendation is annually; but this can vary from home to home depending on the amount of people, pets, and loads of laundry done per week. We have some customers that have 6 family members, 2 dogs, and 4 cats; that do 1 to 3 loads per day. They have their dryer vents cleaned every 3 to 6 months. On the flipside; we have customers that live by themselves that do laundry once a week. That can go upwards of 3 to 5 years before having the dryer vent cleaned again. Warns you before your dryer vent becomes a hazard! 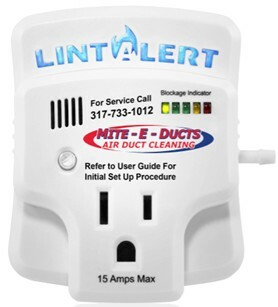 Mite-E-Ducts now offers the Lint Alert Monitor. This monitor is installed once the dryer vent has been thoroughly cleaned to a “like new” condition -or- with the installation of a new dryer vent. The Lint Alert Monitor will tell you when your dryer vent is due to be cleaned. It has 5 L-E-D lights that will go from Green, to Yellow, then to Red. When the lights get up to Red; it will sound a quiet, but noticeable alarm (which you can silence by pushing a button), and will flash until the obstruction is removed from the dryer vent. This device is revolutionary! I have one in my home and recommend them to everyone with a dryer vent! Especially those of you with a 2nd story and/or roof dryer vent; we know you probably wont want to jump up on the roof in the middle of winter to find out if your dryer vent is obstructed. Call Mite-E-Ducts today at 317-733-1012 for more info! This is really good question if one cleans their dryer vent on regular interval then there are less chances of getting new or to replace. If one is not cleaning vents then you have to pay more & some time even much that you have to replace or buy new one..